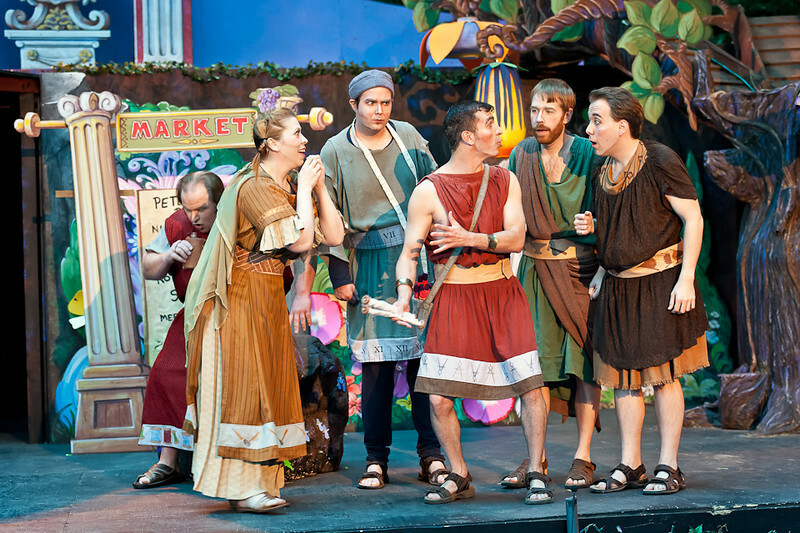 Silicon Valley Shakespeare started in 1999, with a single production each year. SVS has grown into multiple productions per year, at multiple venues, including non-Shakespeare classics, and new works with classic influences developed by local artists. Here you can see more about our past productions, including the casts, staff, programs, and production photos. 1999 Twelfth Night, by William Shakespeare. Directed by Sara Betts. 2000 As You Like It, by William Shakespeare. Directed by Dinna Myers. 2001 The Two Gentlemen of Verona, by William Shakespeare. Directed by Sara Betts. 2002 Much Ado About Nothing, by William Shakespeare. Directed By Dinna Myers. 2003 A Midsummer Night’s Dream, by William Shakespeare. Directed by Doll Piccotto. 2004 Hamlet, by William Shakespeare. Directed by Dinna Myers. 2005 Measure for Measure, by William Shakespeare. Directed by Jeff Bengford. The Merry Wives of Windsor, by William Shakespeare. Directed by Dinna Myers. 2006 The Taming of the Shrew, by William Shakespeare. Directed by Angie Higgins & Sharon Salazar. Romeo and Juliet, by William Shakespeare. Directed by Larry Barrott. 2007 Macbeth, by William Shakespeare. Directed By Karen Moore. The Tempest, by William Shakespeare. Directed by Dinna Myers. Shakespeare’s Most Wanted, written and directed by Doll Piccotto. 2008 Twelfth Night, by William Shakespeare. Directed by Dinna Myers. The Comedy of Errors, by William Shakespeare. Directed by Larry Barrott. The “Dear Will” Letters, by Doll Piccotto. Directed by Larry Barrott. 2009 Richard III, by William Shakespeare. Directed by Ross Arden Harkness. As You Like It, by William Shakespeare. Directed by Angie Higgins. 2010 The Merchant of Venice, by William Shakespeare. Directed by Bryan Freeman. Much Ado (About Nothing), by William Shakespeare. Adapted and directed by Larry Barrott. Rosencrantz and Guildenstern are Dead, by Tom Stoppard. Directed by Dinna Myers. 2011 The Imaginary Invalid, by Molière. Translated and directed by Shawn Andrei. Henry V, by William Shakespeare. Directed by Larry Barrott. A Midsummer Night’s Dream, by William Shakespeare. Directed by Dinna Myers. 2012 The Lion in Winter, by James Goldman. Directed by Dinna Myers. Pericles, Prince of Tyre, by William Shakespeare. Directed by Doll Piccotto. King Lear, by William Shakespeare. Directed by Angie Higgins. 2013 Twelfth Night, by William Shakespeare. Directed by John Rutski. Romeo and Juliet, by William Shakespeare. Directed by Jeanie Smith. The Complete Works of William Shakespeare (Abridged), by Adam Long, Daniel Singer, and Jess Winfield. Directed by Vera Sloan. 2014 Tartuffe, by Molière. Directed by Larry Barrott. Othello, by William Shakespeare. Directed by Dawn Monique Williams. Pride and Prejudice, by Jane Austen. Adapted by Joseph Hanreddy and J.R. Sullivan. Directed by Angie Higgins. 48-Hour Play Festival – Shakespearean Epilogues at San José State University. 2015 The Tempest, by William Shakespeare. Directed by Dinna Myers. The Comedy of Errors, by William Shakespeare. Directed by Angie Higgins. Antony and Cleopatra, by William Shakespeare. Directed by Larry Barrott. Shakespeare in Hollywood, by Ken Ludwig. Directed by Doug Brook. 48-Hour Play Festival – Shakespeare Mashups at Foothill College. 2016 Wakespeare, or What He Willed, written by Doll Piccotto. Love’s Labour’s Lost, by William Shakespeare. Directed by Shannon deMelo. Julius Caesar, by William Shakespeare. Directed by Richard Farrell. The Three Musketeers, by Ken Ludwig. Directed by Doug Brook. 48-Hour Play Festival – CyberShakes at Foothill College. 2017 The Hood of Sherwood workshop, written by Doug Brook. The Merry Wives of Windsor, by William Shakespeare. Directed by Doll Piccotto. Hamlet, by William Shakespeare. Directed by Angie Higgins. Sherlock Holmes and the Adventure of the Suicide Club, by Jeffrey Hatcher. Directed by Shawn Andrei. 2018 48-Hour Play Festival – ShakesSports – at Foothill College. Shakespeare’s Most Wanted, by Doll Piccotto. Directed by Doll Piccotto and Angie Higgins. As You Like It, by William Shakespeare. Directed by Cynthia Lagodzinski. The Hood of Sherwood, by Doug Brook. Directed by Caroline Clark. Much Ado About Nothing, by William Shakespeare. Directed by Angie Higgins.